I like the turquoise shades and aquamarine - particularly this time of year. Before long it will be warm enough for swimming pools and butterfly chairs. These colors remind me of the delicious jolt of walking out of the Arizona heat into an air-conditioned lobby. You'd think I'd have a lot of these hues in my little California home...but I don't. 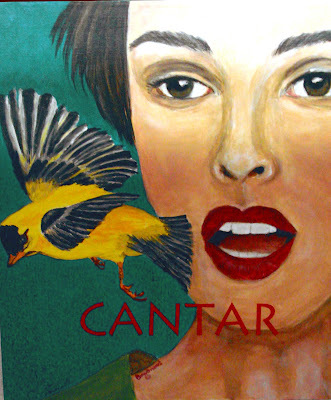 I do use the color in some of my painting though...in "Cantar" it is at its boldest and contrasts perfectly with the canary yellow...it makes you want to sing, don't you think? 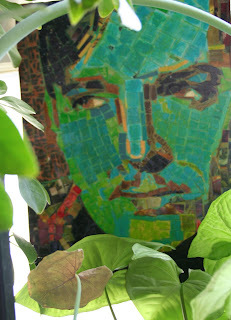 This Clark Gable paper mosaic is hung in my kitchen window among the various plants that live there. He is an original mosaic on wood panel and can be yours for $200 + shipping...size is 9 x 12.